George will be holding a Creative Journaling Workshop on four Friday evenings during April and early May. 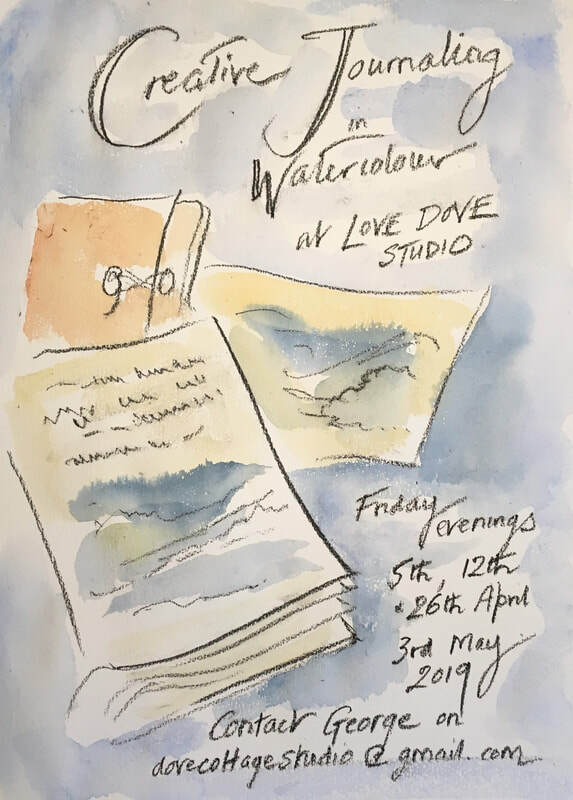 Incorporating tuition in working with watercolour and ink, each workshop will focus on exploring various ways to approach creative journaling, with the emphasis on each student's requirements. This is not a course, but a series of introductory sessions, each of which will have its own dynamic, but additional sessions will provide practise and experience. You can come along to one or more as you wish. The cost is £50 per session, or £180 for all four. Pens, brushes, paints etc will be available for use if you do not have your own, but you may wish to bring a notebook or journal of your choice in which to work. Failing that, some quality paper can be provided for your initial work. Contact George via the Contact page below if you have any questions, or to book. Booking is essential as places are limited. Booking is essential as places are limited. Sessions open at 6:00pm to start around 6:30, closing around 8:30pm.